American earth weather satellite. DMSP 5D-2 was the military's sixth generation of weather satellites. Meteorology satellite built by RCA Astro → GE Astro → Martin Marietta → Lockheed Martin Astro, USA. Launched 1982 - 1997. Used the TIROS-N Bus bus. AKA: Defense Meteorological Satellite Program. Status: Operational 1982. First Launch: 1982-12-21. Last Launch: 1997-04-04. Number: 9 . Gross mass: 770 kg (1,690 lb). Height: 3.40 m (11.10 ft). 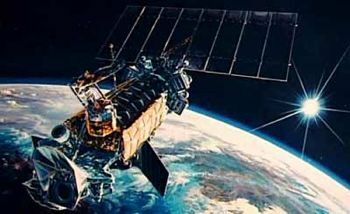 The DMSP 5D-2 satellites operated in two-satellite constellations to provide world-wide meteorological, oceanographic and solar-terrestrial physics measurements on a twice-daily basis. The visible and infrared sensors collected images of global cloud distribution across a 3,000 km swath during both daytime and night time conditions. The R&D cost for DMSP 5D-2 was $ 7.6 million. The first joined 5 earlier generation DMSP's still operating in orbit. Launch of 8 more continued through 1997. More at: DMSP Block 5D-2. Family: Earth, Earth weathersat, Sun synchronous orbit. Country: USA. Engines: Star 37S. Launch Vehicles: Titan, Atlas, Titan II, Atlas E, Titan II SLV. Projects: DMSP. Launch Sites: Vandenberg, Vandenberg SLC3W, Vandenberg SLC4W. Agency: USAF, NOAA, Astro Space. Bibliography: 2, 278, 4, 6, 12236.